I am new to caring for geckos and I recently purchased a baby leopard gecko. Perhaps some of you more experience leopard gecko owners could help me determine how old she actually is? She is developing spots and has a pretty good sized tail; i'd love to hear all of your opinions or guesses! Welcome and congrats! I'm going to guess 3-6 months, though there's no way to really know for sure. Aliza, Thanks so much for the reply! I do not know her age for sure but I would say that's a pretty good guess! since I really don't have experince with that. good luck she's very pretty ! If you can confirm Mango's gender, she's at least 6 months old. 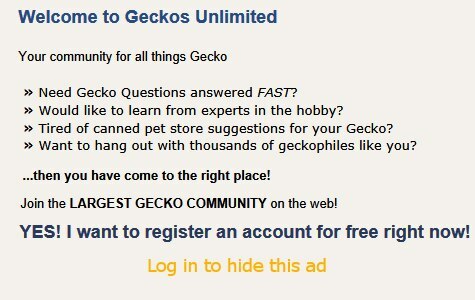 Sexing Leopard Geckos -- At about 6 months old a leopard gecko's gender can be confirmed. Males can be distinguished from females by a distinct /\-shaped row of pores above the vent and by two hemipenal bulges below the vent. To see their vents, potential male pores, and hemipenal bulges gently press their bodies up against the glass. They'll squirm if you try to turn them over. Last edited by Elizabeth Freer; 04-11-2019 at 10:03 AM.